Westminster Abbey is a famous church in London, United Kingdom. It appeared in Mario is Missing!, when Luigi visited the city. Koopa Troopas stole a Bust of Shakespeare, who has funeral monuments in Westminster Abbey. 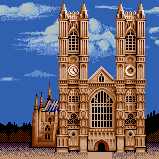 Luigi has to check all the Koopa Troopas in London for the Bust, and if he finds it, he can return it to the Abbey, being rewarded with a prize of 1,620 dollars. Edward the Confessor, a onetime ruler, ordered the building of Westminster Abbey -- officially known as the Collegiate Church of St. Peter in Westminster -- to serve as his burial place. From his death in 1066 until 1760, most British and English sovereigns were buried there. Perhaps to get their money's worth, The Abbey has also been the site of coronations and many royal weddings. Considered a masterpiece of Gothic architecture, the Abbey has undergone many renovations.